This is our closest look yet at Magic Leap's mysterious tech. Magic Leap, the mysterious augmented reality company, is teaming up with Lucasfilm and its ILMxLAB to create immersive Star Wars experiences, the companies announced today at Wired's Business Conference. 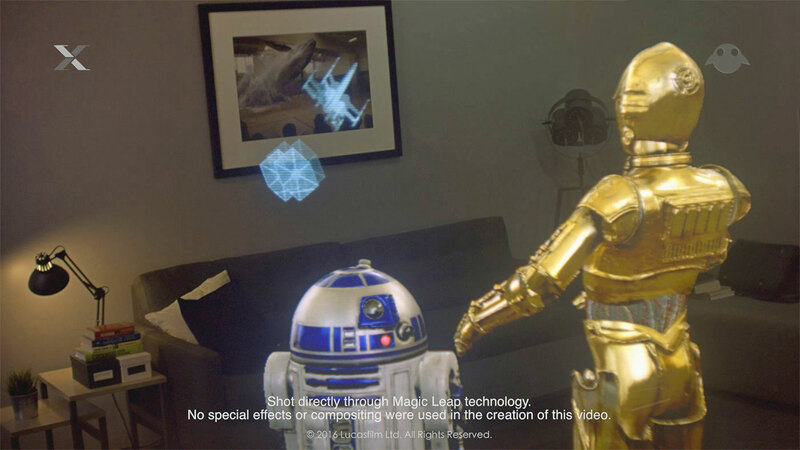 As part of the news, they also revealed our closest look yet at Magic Leap's technology in action with a demo video featuring everyone's favorite droids, C-3PO and R2-D2, projected in a typical office environment. It was shot on actual Magic Leap hardware, according to ILMxLAB's John Gaeta (best known for his work on the Matrix films), using a standard digital camera. One look, and you'll see why Magic Leap has amassed an astounding $1.39 billion in funding without shipping an actual product. Unlike the simplistic graphics on Microsoft's HoloLens, Magic Leap's renderings of the famous Star Wars droids are surprisingly realistic. Both C-3PO and RD-D2 are life-sized and incredibly detailed, with a surprising amount of depth. We also catch a glimpse of the monochromatic holograms seen all over the series, and they look practically indistinguishable from the Star Wars films. Most intriguingly? Gaeta says there wasn't any post-processing involved in the video, ILMxLAB simply captured what Magic Leap's gear spit out. Magic Leap and Lucasfilm aren't talking about what sort of specific experiences we'd see yet from their partnership, but one possibility thrown out involved turning C-3PO into your augmented reality assistant. What if you could have your very own intelligent C-3PO that follows you around all day, with all of the personality quirks you love (and hate) from the movies? That wouldn't just appeal to geeks, it's the sort of thing anyone would lap up. As part of the partnership, ILM will house a secretive lab in its San Francisco headquarters, which will include Magic Leap employees. Lucasfilm's story group, the folks who are building the Star Wars mythology for films and other mediums going forward, will also take part, along with Skywalker Sound. Get ready for far more immersive Star Wars experiences than ILMxLAB's Trials on Tatooine VR experiment. While Magic Leap CEO Rony Abovitz still won't say when we'll see a consumer product from the company, he revealed that it's kicking off its production line to test its manufacturing capabilities. "We may have a system that looks like it's shipping, but we're debugging and it looks like it's coming soon," he said.